Turn up the volume and get ready to pick your jaw up off of the floor. 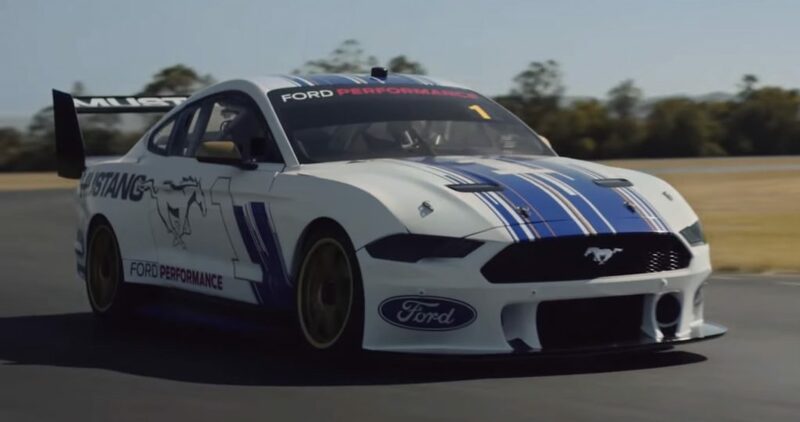 Ford just released this video showing the new 2019 Ford Mustang Supercar just in time for the 2019 Virgin Australia Supercars Championship. Watch as the latest Ford Mustang Supercar rips around a track in an official Ford Performance livery. The 2019 Mustang Supercar shows off many elements of the road-going Ford Mustang GT’s iconic design cues, while soothing the ears with a rampant V8 soundtrack. It does have a slightly larger wing than any road-going ‘Stang, but we aren’t complaining. Just look at that wing. Ford and Ford Performance, alongside partners from Shell V-Power Racing and Tickford Racing, have designed, engineered, and homologated this new Ford Mustang Supercar for the 2019 Virgin Australia Supercars Championship. The Mustang was officially approved by Supercars back in December, however the car was heavily camouflaged prior to this video being released yesterday. Six Mustangs from three teams will enter the 2019 series. Two Mustangs will represent Shell VPower Racing, three for Tickford Racing Mustangs, and the final Mustang will race for 23Red Racing. The Ford Performance Mustang Supercar will make its on-track debut at the Superloop Adelaide 500 from February 28 to March 1, 2019. Subscribe to Ford Authority for updates on the new Ford Mustang Supercar all season long. Whats up with the goofy, tall, greenhouse? Especially considering that the driver practically sits on the floor in those things (Supercar Race cars). That said, supposed increased visibility is not an argument here. Did they find some quirk of aerodynamics or is there some safety rule that dictates this? I hope it’s not because they literally just silhouetted mustang body panels over a standard Ford Supercar chassis – actually I know it is…just hoping it’s not so. jzEllis the Mustang looks as it does because they (Ford) had no other choice but to “fit” it over a set 4 door roll cage.